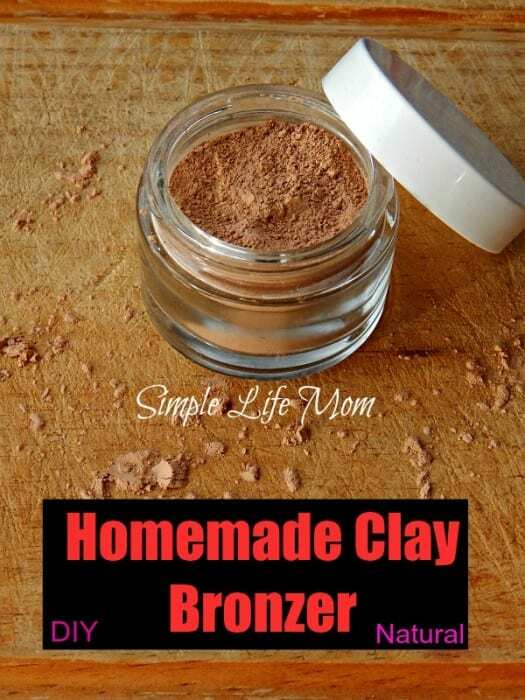 I accidentally came across a natural clay bronzer. I was wanting to make a red swirl in my Candy Cane Soap and thought I’d try Pink Kaolin Clay and Red Moroccan Clay. Well, it turns out that while Pink Kaolin Clay is a beautiful pink color (which is great for blush, by the way), Red Moroccan clay is…well….not. It’s a beautiful TAN color!! I immediately thought – Foundation! And it would be a wonderful foundation. It spreads evenly and leaves your skin silky smooth looking. But, it’s definitely too dark to use as a foundation on my skin (but adding some arrowroot powder could fix that). I love it as a base for a bronzer because I’m not starting from a white arrowroot powder or a darker cocoa powder base. Instead, I can barely tweak it for my skin tone as it changes during summer and winter and it has a beautiful natural color that would go well with a lot of people’s skin tone!! …a fake tan. Please don’t use this all over your body or you will probably end up looking like someone who didn’t spread their fake tan lotion out evenly. …to be put all over your face. This kind of defeats the purpose and you’re using it more like a foundation. Wake up a tired looking face. Contour features like cheekbones and nose. I like to use a natural bronzer in the winter. I start to look pale and people ask me if I’ve been getting enough sleep (Yes, we all loooove those kinds of comments). I do not use so much that I look like I was in Florida for a few weeks, but I subtly use it in a few areas to give a slightly sun kissed look. Where? Think of where the sun would hit you the most: sides of your face, cheek bones, tip of chin, nose, and on each side of your forehead. Option#1 – Red Moroccan Clay straight out of the container. Lucky You! Option #2 – You need it to be a bit darker, so add some cocoa powder (no one will smell it but you, so don’t get hungry). Start with 2 Tbsp of Red Moroccan clay and add 1/4 tsp of cocoa at a time until you’re happy. Write down what you like so you won’t have to guess next time. Option #3 – You need it to be a bit lighter, so add arrowroot powder. 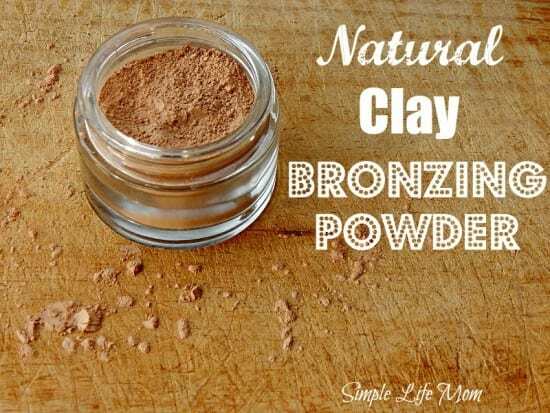 Start with 2 Tbsp of Red Moroccan clay and add 1/4 tsp of arrowroot powder at a time until you’re happy. Write down what you like so you won’t have to guess next time. Shared on some of these great blogs! Want a Great Homemade Foundation Recipe? Check these out! How about inhaling it while applying? I like the idea and I want to try it out, but I have some concerns since the powder is so fine. Good question. It’s no lighter or finer than other powders used for makeup. I haven’t found anything going into the air while using a brush. This looks like I would work great. I love the thought that it is made from natural clay. This is so clever and looks like it would work great. You are such a smart cookie!! Wow, that’s amazingly easy!! I know some people I could share this with!! Thanks Rachel. I hope you all enjoy. It is good for the skin. Clays are good at normalizing your oils so that you are not too dry or too oily. I have never tried making my own beauty products, but I like that this is all natural. The older that I’m getting, the less that I want chemicals on my skin. I know. We start to look at things a little closer. I’m going to definitely share this post with my daughter. She loves everything to do with make-up and prefers natural ingredients. Thanks! 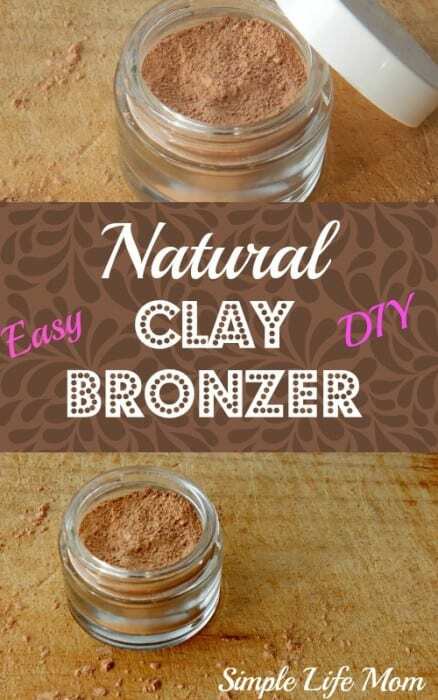 I like to use bronzer in the winter too, this homemade version looks great! I don’t wear much makeup, but I’ve used a bronzer in the past. When you are tired and need a little color, this is perfect. This is so cool! I learned something today. Thanks for sharing your bronzer with us at Mommy Minday!